Civilization was never the most realistic game, and those who enjoyed battling against a nuclear-armed Gandhi have not minded. 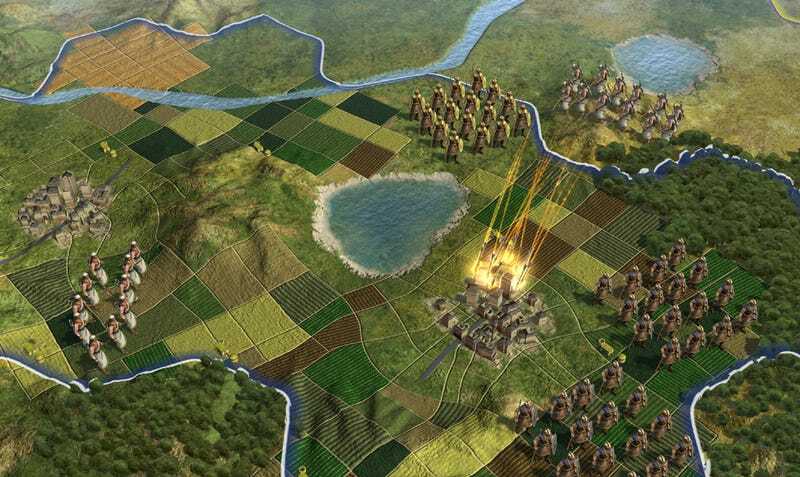 The next one, Civilization V, though may be the most natural one thanks to some crafty tweaks. Kotaku was shown an early version of development studio Firaxis' Civ V running on a PC on the first day of Game Developers Conference here in San Francisco. What was shown was a Civ that behaves just a little more like it is in the real world in regards to everything from terrain to the rules of war and international relations. All have been modified to feel more true to life and more rife than ever with strategic potential. The game is still a turn-based single or multiplayer quest requiring ample brainpower and planning. Like other Civilization games, the player goal is to lead one tribe from the founding of a city to a position of global leadership, via military or peaceful means. The most obvious difference is the look of Civ V's terrain. As can be seen in screenshots it, looks more like real Earth. A representative of the studio showing the game said this new Civ's worlds might look pre-rendered but are still, true to the series, randomly generated. An optional overlaid grid shows that the world is indeed divided into hexagons, a first for the series, which used to chop things up by squares. The ground looked good, lifted naturally by mountain ranges and cut by rivers. As good as those graphics looked, the game is supposed to be able to run on the widest range of PC hardware specifications supported by the series yet, from laptops Civ fans use on planes to high-end PCs. The current minimum spec Firaxis is hoping to accommodate are 256 MB video cards and dual core processors. That target might change. A lot of small changes have been made to the core Civ gameplay, tweaks that appear to have major implications. Players get a notification system this time, which alerts them to important new events such as a new bit of research being completed or a scouting party being attacked. Clicking on the alerts that appear on the right side of the screen, when relevant, warps the player to the location of the event. Advisers are back in Civ V, characters who pop up to offer tips, Rival civilizations are now being programmed to fight with noticeably distinct artificial intelligence styles. (Less consequential to gameplay is the introduction of full-screen animations of rival leaders such as George Washington or Napoleon, set in character specific locales). New city states appear on the map. These are always controlled by the computer. Players can enter pacts with them, trade with them, or even attack them. This complicates the relationships among the major civilizations, as an America that is friends with Budapest might be drawn into a war if it tries to free a besieged Budapest from the French. The city states were described by one developer showing the game as elements that "are there to make things happen." A great civilization's area of influence used to spread evenly in Civ games. In the new one, a player will see the colored border representing the limits of their people's reach expand in more realistic ways. Turn after turn, the computer will automatically expand a player's civilization into areas that have relevant resources, say forest instead of desert, early in the game. Players can spend gold to speed the expansion. Combat has changed. Players will no longer be able to stack units onto one space and then carry that offensive stack to war. Each unit — which still represents and is depicted by — a cluster of fighters, can only occupy a space on its own. New ranged units can fire from afar (an extra hexagon away for the archers, according to the demo this week). And cities, which now have health bars, can fire back. A number of other changes may be big or little. It's hard to say. The developers said great civilizations can now agree to commence a research agreement, instead of just establishing trade or declaring war. The game will now allow easy access to a catalogue of user-uploaded mods. And, as a tease, the developers said there will be surprises as to how non-military ways of winning the game, the standard cultural and technological victories, for example, will be designed. Civilization V, which appears to be a crafty evolution for the franchise, is set for release on PC this fall. No Mac version is planned for launch, but the producer noted that all Civ games have eventually come out for Apple computers.